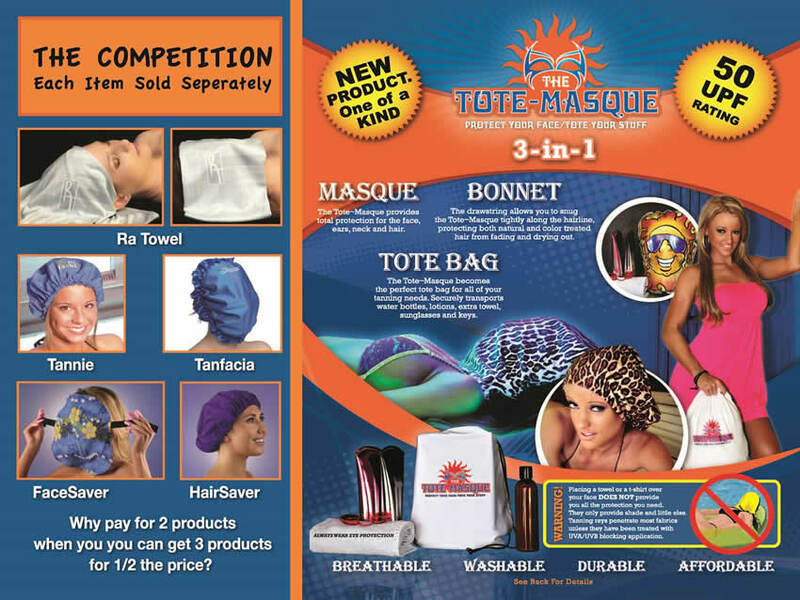 Introducing the Tote~Masque, the hottest new product to hit the tanning industry in years! Designed for the discriminating tanner that wants complete face, neck, ear, and hair protection at all times. Cutting edge fabric, unique design, superior protection. Get yours today! The Tote~Masque is made of a revolutionary stretch material with a 50+ UPF (Ultraviolet Protection Factor) rating. That means superior sun protection that blocks harmful rays. 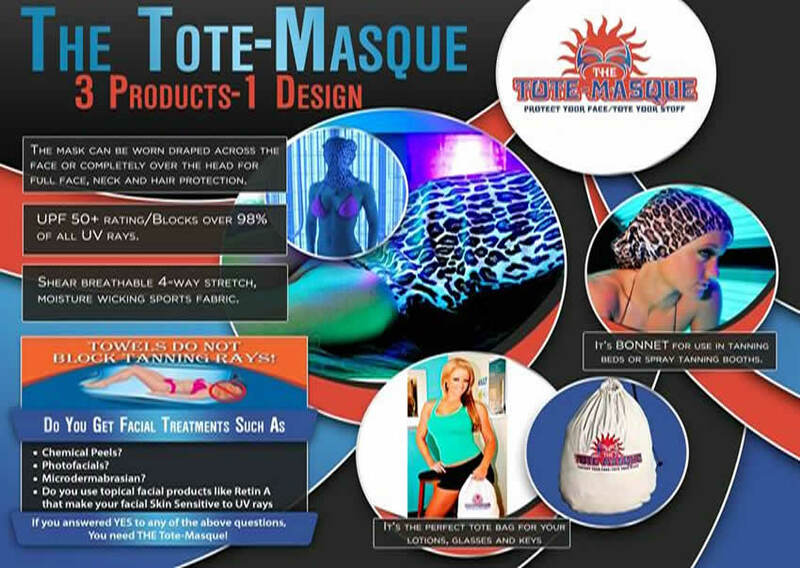 Only the Tote~Masque offers true 50+ protection... More than any other product on the market! Our unique synthetic fabric features moisture wicking, which draws away sweat and moisture, so you always feel calm and comfortably cool. What's more, it has been treated with an antimicrobial agent that prevents the growth of microorganisms within the material. Always wear eye protection. What does antimicrobial treated fabric mean? Antimicrobial fabrics have been treated with an application that kills or inhibits the growth of microorganisms within the material. This is a very important feature of the Tote~Masque given the conditions and environment in which it is used. Placing a towel or t-shirt over your face DOES NOT protect you from harmful UV rays! Items like these provide shade, but little else. Tanning rays penetrate most fabrics unless they have been treated with a UVA/UVB blocking application. Only the Tote~Masque offers true 50+ UPF. Other products currently on the market may claim to block UVA/UVB rays, but such chemicals cannot be applied to porous, mesh fabrics. Only the Tote~Masque fabric allows such blocking chemicals to be applied. Customers have many reasons why they may want to protect their face, neck, ears, and hair from tanning rays. Many customers today have had cosmetic procedures on their face and neck such as Photofacial, microdermabrasion, chemical peels that make them highly sensitive to tanning rays. Others may take prescription medications that make their skin sensitive to tanning rays. Other customers may want to protect their color treated hair, protect their scalp and keep their hair from drying out and becoming brittle. The Tote-Masque can protect your tanners’ faces, hair and so much more – good reasons why you should offer this amazing product at your salon! There are many people who want a deep, dark tan… just not on their faces. After undergoing a series of cosmetic photofacial laser treatments on his face and neck, Glenn Cole was one of these tanners. When he learned that covering his face, neck and ears with a towel or T-shirt was not viable UV protection, he began searching for a product to protect the entire head but found only bonnets or face masks. Seeing a niche in the marketplace, he created The Tote-Masque, a three-in-one product designed to protect the entire head – face, neck and ears – and chemically treated hair from UV rays. It’s the perfect thing for tanners who want that extra protection, many of whom might be your salon guests. The Tote-Masque by Solar Armor, LLC, is more than just a face-protector as it’s really three exciting products in one. “Its main use is to protect the face, neck, ears and hair from more than 98 percent of all UVA/B rays,” said Cole, Solar Armor President/Founder. “It can also be used as a bonnet to protect the hair during a UV or spray-tanning session, and converts into a tote bag for carrying a tanner’s belongings.” Many tanners already use this tote function to carry their lotions, eye protection, and anything else they take with them to the salon. The Tote-Masque features a best-of-both-worlds construction. It’s made from a cutting edge, four-way stretch fabric that’s sheer and breathable, and has a UPF 50+ rating as well as moisture-wicking and antimicrobial properties. 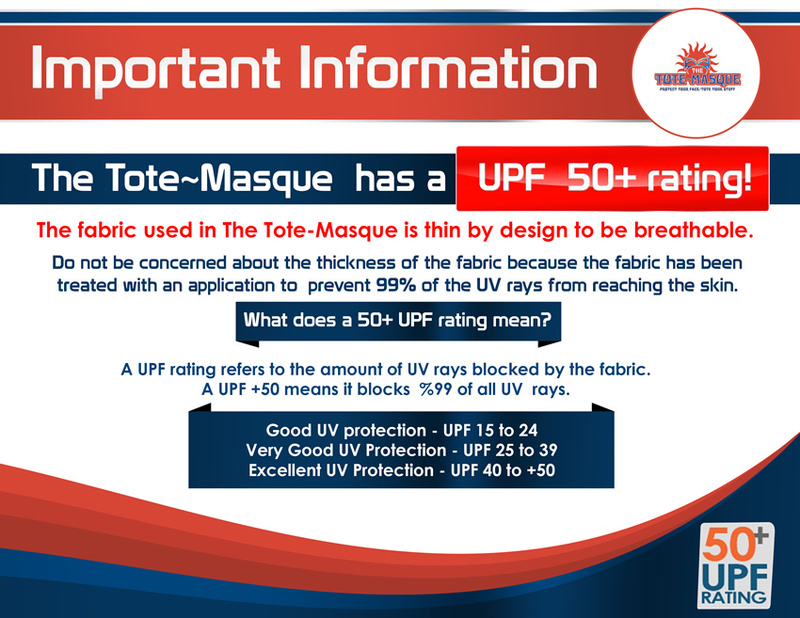 “The UPF rating refers to the amount of UV rays blocked by the fabric,” Glenn explained, “and an Excellent UV protection rating is given to all fabrics with a UPF between 40-50. Moisture-wicking fabrics draw sweat and moisture away from the skin, keeping it dry and cool, and the fabric is also treated with an application that kills or inhibits the growth of microorganisms.” This antimicrobial treatment is especially useful given the conditions and environments in which the product is used. With a wholesale cost of only $5 and a suggested retail price of $19.99, Tote-Masque is a tremendous value for both salon owners and tanners. “We recommend asking salon guests if they tan their face,” Glenn said, “and then educating those who are using towels, T-shirts and clothing as protection. This creates the perfect opportunity to introduce the Tote-Masque.” The recent explosion in day spa facial treatments, Glenn adds, has created a great market for the product. “This makes it an easy sell for nearly any salon professional!” he exclaimed.